The European Commission has fined Nike €12.5 million for banning traders from selling licensed merchandise to other countries within the EEA. 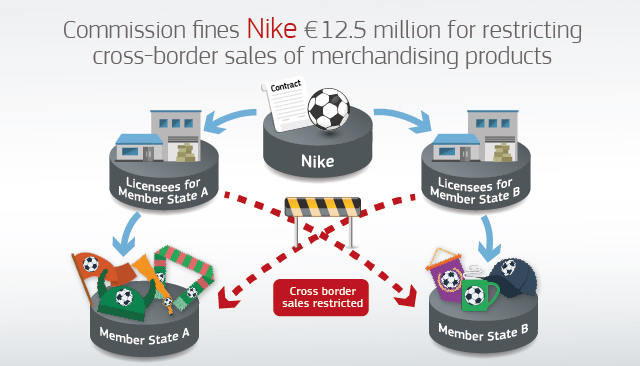 This restriction concerned merchandising products of some of Europe’s best-known football clubs and federations, for which Nike held the licence. The fine was set on the basis of the Commission’s 2006 Guidelines on fines. Regarding the level of the fine, the Commission took into account, in particular, the value of sales relating to the infringement, the gravity of the infringement and its duration, as well as the fact that Nike cooperated with the Commission during the investigation. The fine imposed by the Commission on Nike amounts to €12,555,000.